If the grace of God were only about our own personal salvation, it would be easy. But when we are called to extend grace to others, especially whose sins are offensive to us, anger us, and disgust us, it becomes very difficult. Speaking to the elders of the church in Ephesus, the apostle Paul insisted that his only aim was to speak truthfully or “testify to the good news of God’s grace” (Acts 20:24). But what Paul had in mind was preaching a message that included both Jews and Gentiles. There’s the rub. That’s what made the grace of God scandalous then and it still remains as scandalous as it ever was. Growing up my younger brother and I loved watching wrestling, especially the Saturday Night Main Event where Hulkamania was sure to run wild on you. Hulk Hogan, with his 24-inch biceps and legions of Hulkamaniac fans, was the attraction. With great charisma and a good-guy persona, The Hulckster, as he was sometimes referred to, went on to have not only one of the most celebrated careers in wrestling entertainment and but an amazing career beyond the squared ring. Pretty good for one man, whose real name is Terry Bollea. But that all came crashing down earlier this year when a secretly recorded video tape from 2006 was released that captured Hogan talking about his daughter dating a black man, using the N-word. Immediately Hogan became a cultural pariah, having committed what the American culture deems as a horrifically shameful sin. The backlash was swift as the wrath of culture’s judgment was meted out which included being fired from the WWE, the wrestling organization he helped turn into premiere franchise of its industry, who quickly put as much distance between the two of them as possible. To be clear, what Hogan said was wrong and totally unacceptable! Using words that demean people for their race shows us just how much damage sin can do. Not only can sin have terrific consequences for our own life, it hurts others too and leads to anger, animosity, and deep divisions. But for someone who has apologized, the extension of grace is still unfathomable. Instead, with a few exceptions, the culture that we are has basically said with our judgment that Hogan is beneath us… what he has done is despicable and unbecoming of us, as though we ourselves have never done anything shameful and wrong. Now please don’t misunderstand me. I am neither trying to mitigate the wrong that Hulk Hogan did nor defend his response. When anyone does wrong, repentance is necessary and the very least, apologies should be offered for any harm done. However, the culture at large is a place where there are certain sins for which we distance ourselves from the guilty offender as though we are somehow better. To offer any kind of grace that would give the person a second-chance, a new start on life, is so unfathomable that it’s scandalous! Contrast that with the theology of God’s grace that Paul is so adamant on testifying about. 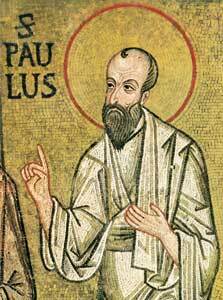 In Romans, Paul was writing to a church of Jewish and Gentile believers. The problem is that the Jewish believers were looking down upon the Gentiles, pointing to their shameful sins, while claiming superiority because they has the law of God which meant they belonged to God’s covenant and has circumcision as a sign of this position. But Paul will have none of that! He reminds this church that they all are sinners and are justified by God through faithfulness of Christ. In turn, Jewish and Gentile believers alike now live by their faith, of which the patriarch Abraham is an example of. That is Paul’s argument in Romans chapters 1-4 and because of this grace, Paul unequivocally says, “Therefore, since we have been declared righteous by faith, we have peace with God through our Lord Jesus Christ” (5:1). So these sinners, who are both guilty of very shameful acts, are not only “made righteous” (justified) but they are at “peace with God.” How can God just forgive such sinners and just set aside the wrong they have done? It’s a good question to ponder because it’s not just those sinners… those Jewish and Gentile believers whom God has made righteous? It’s us! By faith, we too are Justified and it is because Jesus died “for us” (5:8). The word for “enemies” is from the adjective ἐχθρός which in the active (provided by the present-participle “being” verb ὄντες) sense describes someone who is hostile and opposing to God. In other words, while we were actively opposing God with our sin, God reconciled us through the death of Jesus. We might say that while we slapping God in the face with our sin, God reconciled us. Verse 10 is also a rhetorical argument about salvation. Paul is saying that if God reconciled us through the death of his Son while we were actively being hostile to God, even more then will we be saved by the life of Jesus. In other words, if God reconciled us even as his enemies, then we can be confident that he will save us in Christ. This is the grace of God! This is how God responds to us, who are sinners. He extends his grace, justifying us and reconciling us so that we are assured of our salvation in Christ. That is also the basis for which we can extend grace and mercy to others because we know that even as we were enemies of God, he extended his grace to us. We live in a culture whose capacity for any sort of grace seems to be shrinking. Commit any certain number of sins that our culture deems outrageously unacceptable and wrath of a public culture is unleashed, just as it was for Hulk Hogan. Grace is as scandalous as it ever was. It was when Paul wrote Romans and it is today. Why? Because the culture at large doesn’t believe that scandalous people deserve forgiveness and a second chance. Not so with God and not so with his people, the church. As scandalous as the grace of God may be, it remains more than ever relevant. What a message for every local church to embody, to be a community where nobody looks upon another because we all know that we are a sinner as much as the next person… knowing that just as God has extended his grace to us, we must extend the message of grace in the way we speak and treat one another. The grace of God is as scandalous as it ever was but if you get it… What a beautiful scandal to be caught up in! This entry was posted in Contemporary Christianity, Contemporary Culture, Scripture, Theology. Bookmark the permalink. Love this! I am also reminded that Paul wrote that we are to be ministers of reconciliation and his letter to Philemon is a great example to us how we might live that out. You make such a good point that we are all over having this wonderful relationship with God and living in light of our forgiveness (which is awesome and true) but we forget that the whole point is that we are the ones who should be pointing to the means and ways in which reconciliation is worked out. And we cannot possibly be ministers of reconciliation if we are unforgiving at heart and harbor any prejudices. I still have my son’s Hulk Hogan action figure, he has managed to survive the bottom of the toy box, along with She Ra. Today I will pray Terry Bollea will find the peace and grace from a God and His people who love him in an unforgiving world. Thanks for your comment. Philemon is a great example of how Paul works out the practical implications of two different people such as a master and slave being reconciled as one to God in Christ. How the two people and how we embody that reconciliation is a measure of how much we really understand the love and grace of God.